If you love saving money, then senior discounts are a great way to get more! 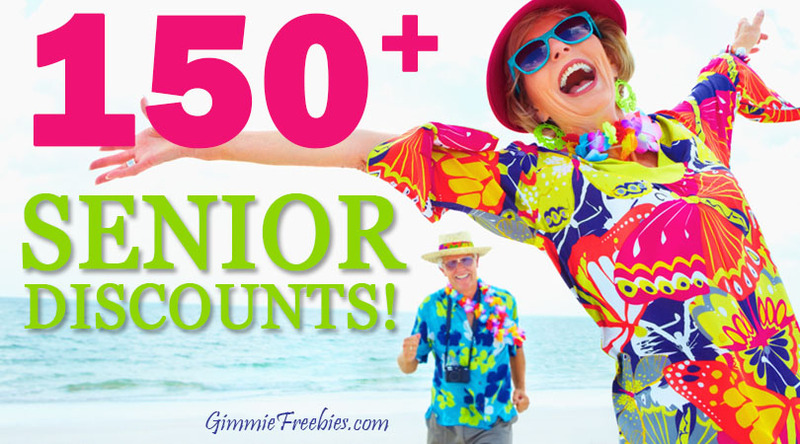 So, we’ve listed over a hundred establishments with senior discounts here. From Applebee’s to McDonald’s and Kroger, we share not only age requirement but the discounts they offer. In addition we’ll show you several AARP discounts available with a membership. The good news is there’s no age restriction and it only costs $12 for the first year, then $16 each year after that. Even though this list is updated regularly, we recommend that you call ahead to double check with your location. After all, who said getting old had to be a bad thing? Due to the fact that saving money is in style at any age! Finally, mature patrons can enjoy discounts from restaurants, retail, grocery, and more! So, head on over to the places listed here and ask about your senior discount! Our readers ask, What is the senior discount age? Certainly, many people think you have to be age 65 and older to be a senior citizen. But, some retailers and restaurants give discounts to those as young as age 50! It really all depends on their local policy. And AARP is even better, because anyone can get their membership! How Old Do You Have to Be to Get AARP Discounts? Some of the discounts in our list are from AARP. And, AARP seems like a senior discount. But, actually AARP has no age restrictions! Most people probably think you have to be age 50 or order to join, but that’s not the case. Anyone at any age can join AARP, and get their membership discounts. The first year AARP membership is $12, and after that it’s $16 a year. Several of the Senior Discounts listed below are AARP membership discounts. To use your AARP discount, simply show your membership card. For the most current and up-to-date AARP discounts, please check your membership with them. A&W Senior Discount All American Food: 10% Senior discount varies by location. Bennigan’s: Get a discount off your meal, but price varies per location. So, contact your local Bennigan’s for discounts. Bonefish Grill: AARP members save 10% on food and nonalcoholic beverages. Dine-in only. Bubba Gump Shrimp: AARP Members save 10% on food and nonalcoholic beverages. 10% off for Military. Carrabba’s Italian Grill: AARP Members save 10% on food and nonalcoholic beverages. Chart House: AARP Members save 10% on food and nonalcoholic beverages. Claim Jumpers: AARP Members save 10% on food and nonalcoholic beverages. Corner Bakery Cafe: AARP Members save 10% at participating locations. Dairy Queen: 10% off or free small drink (60+). Price varies per location, contact your local Dairy Queen for discount percentages. Denny’s: AARP Members save 15% on their check all day, every day at participating locations. Hardee’s: 33 cent beverages, and some locations offer 10% off entire bill. Landry’s Inc: AARP Members save 10% on their check every day at participating restaurants, including Aquarium®, Babin’s Katy, Brick House Tavern & Tap®, Cadillac Bar®, Charley’s Crab®, Fish Tales, The Flying Dutchman®, Gandy Dancer®, Grand Concourse, Grotto®, Joe’s Crab Shack®, Lighthouse Buffet, Meriwether’s®, Mitchell’s Fish Market®, Peohe’s®, River Crab Blue Water Inn, Rusty Pelican®, Simms Steakhouse, T-Rex® Cafe, Willie G’s® Seafood & Steaks, and Yak & Yeti® Restaurant. Landry’s Seafood: AARP Members save 10% on food and nonalcoholic beverages. McCormick & Schmick’s: AARP Members save 10% of their check. The Oceanaire® Seafood Room: AARP Members save 10% on food and nonalcoholic beverages. Outback Steakhouse: AARP Members save 10% on food and nonalcoholic beverages. Dine-in only. Papa John’s Senior Discount: varies by store; ask your local PJs. Rainforest Cafe: AARP Members save 10% on food and nonalcoholic beverages. Saltgrass Steak House®: AARP Members save 10% on food and nonalcoholic beverages. sweetFrog Premium Frozen Yogurt: AARP Members save 15% on all in-store purchases of frozen yogurt, treats, apparel, and 15% on gift cards purchased online. White Castle: 10% off (62+). Must have the White Castle Discount Card. Banana Republic: 10% off (50+). Discount and age varies by location, contact your Banana Republic store for details. Bealls: Save 15% on all purchases every Tuesday with the Club 50 Plus. Proof of age is required. Lens Crafters: 30% off lenses and 40% off transitions for AARP Members. Michael’s: 10% off on Tuesdays with AARP card. Modell’s Sporting Goods: 10% off purchases. Rite Aid: 10% off on Tuesday & 10% off prescriptions. Tanger Outlets: Free coupon book for AARP members. TJ Maxx: 10% off on Tuesdays depending on location. Stein Mart: 20% off red dot/clearance items first Monday of every month (55+). Publix: 5% off every Wednesday (60+) Not valid in Florida. Alaska Airlines: 10% OFF fare for select itineraries for passengers who are 60 years and above. British Airways: AARP Members save $65-$200 on round-trip tickets purchased on BritishAirways.com to over 130 cities in Europe, Asia, the Middle East and Africa. Continental Airlines: No initiation fee for Continental Presidents Club & special fares for select destinations. Hampton Inn and Suites: 10% off when booked 72 hours in advance. Motel 6: 10% off for AARP members. Collette River Cruises: AARP Members save up to $100 per person on tours and river cruises of seven days or more to all continents. Options include land tours, river cruises, rail journeys, value tours and more. Grand European Travel: AARP Members save $100 per person on over 30 luxury river cruises in Europe, Asia and Egypt. MedJet: AARP Members save up to 20% on Medjet memberships. MedjetAssist covers hospital-of-choice medical transfers, including all transport costs, when you’re more than 150 miles from your home. MedjetHorizon includes all the benefits of MedjetAssist, plus worldwide travel security, crisis response, and evacuation services. Park Ride Fly: AARP Members save 12% on reservations made at any of Park Ride Fly USA’s 150 off-airport parking locations nationwide. Reservation includes luggage assistance, airport shuttle and more. Xanterra: AARP Members save 10% on merchandise purchased at National Park gift shops operated by Xanterra Travel Collection in Yellowstone National Park, Grand Canyon National Park, Death Valley National Park, Mount Rushmore National Memorial, Zion National Park, and more. Avis: AARP Members save up to 30% off base rates, plus get an upgrade on compact through full-size car class bookings (based on availability), an additional driver at no cost, and more. Budget Rental Cars: 10% off; AARP Members save up to 30% off base rates, plus get an upgrade on compact through full-size car class bookings (based on availability), an additional driver at no cost, and more. Budget Truck Rental: AARP Members can save 20% on local or one-way truck rentals on Sunday through Thursday and 10% on Friday and Saturday, plus receive a $10-per-day Physical Damage Waiver. Hertz: Save up to 25% off for AARP members. Payless Car Rentals: AARP Members save 5% on leisure daily, weekly, weekend, and monthly base rates, plus get a free upgrade on compact through full-size car class bookings. Zipcar: AARP Members get 43% off an annual Zipcar membership, plus $40 in free driving credit. Cinemark/Century Theaters: Up to 35% off. Regal Cinemas: Up to 30% off. The pharmacies listed here are all covered for AARP Members and their families to save on FDA-approved medications not covered by current insurance. PetPlan Pet Insurance: AARP Members save up to 10% on premiums when signing up online, plus receive a Visa® Prepaid Card (up to $35) to help cover wellness expenses. Plans are accepted at every veterinarian in the U.S. and Canada. Since many senior discounts are not advertised to the public, men and women over 55 should ALWAYS ask a sales associate if that store provides a senior discount. Also, please note that some vary by region. In other words, you can be sure to get the most bang for your buck!